The certification program was no easy ride. I had to do multiple days of training in Arizona, study thick manuals, watch pre-certification videos, practice several DISC debriefs, and take a six-hour exam. All of this effort is worth it, however, when I see how the tool helps people do what they do better. Today I want to focus on how DISC can be used to improve virtual teamwork. Working across distance and time is difficult for most human beings. After all, we are genetically programmed to want to be physically together in the same place. Back when all members of societies on Earth were nomads or hunter/gatherers, being in close proximity to your clan or tribe meant the difference between life and death. We are still highly dependent on one another. Today, most teams in the corporate setting are engaging virtually, yet still need to produce the same results as if they were co-located. The challenges are numerous, but research and my experience show that communication remains the biggest hurdle. It is difficult to achieve clarity, build rapport, and avoid confusion in the virtual workplace, but it is possible. One of the biggest virtual communication challenges is that without video, we miss out on so many cues including tone, body language, and context. Many of us communicate primarily through email and/or instant messaging, neither of which gives us full insight into a person’s behavioral style. How do we overcome these hurdles? Several factors play into virtual team success (for more on these factors, check out this article I wrote for Industrial Management Magazine: https://www.highroaders.com/wp-content/uploads/2017/06/industrial-management-may-2017-space-program-global-teams.pdf). But one tool we could take more advantage of is DISC. Many of my clients have taken the DISC assessment, but when I ask if they have shared it with their team members, many have not. In DISC, there are no good or bad profiles. It is a neutral assessment, as all styles have their strengths and limitations. 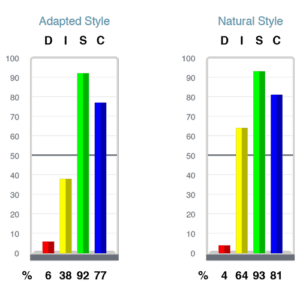 Therefore, sharing your DISC profile should be a natural next step to increasing your own awareness of your style. When team members read your profile, they will have an explanation for your behaviors, as well as some strategies for communicating effectively with you. In a virtual environment, this is crucial because of all the behavioral information we are missing. Use the highlighter in a PDF file to highlight the parts of the DISC profile that most accurately describe you. Also highlight the most relevant strategies others can use to be effective with you. Send the highlighted or condensed profile to your key virtual team members. Encourage them to share their profiles. Pay attention to all four DISC styles, not just your primary style. Inform team members on which aspects of your behavior may not be visible in a virtual setting, but which are important to your daily work. Use DISC during annual meetings, strategy meetings, or other forums where teams gather together. Hire a facilitator to guide your team through the applications of DISC for your business. If you have taken DISC, why not take that next step and share it with your virtual team? You may also consider taking an assessment called 12 Driving Forces, which reveals the why behind your actions and behaviors. This tool paired with DISC is a powerful combination. I have seen clients improve their job performance, open themselves to new ideas, and increase their effectiveness at work as a result. In the virtual setting, we need all the help we can get to communicate effectively. So let’s talk! If you are interested in taking the DISC assessment or exploring how it can help your team, please contact us at vicki@highroaders.com or 770-936-9209. The Global Virtual World: What is Lost and How Do We Compensate? The New Global Team Mindset: Are You Ready?